You'll be able to travel with your pet easily and hands free in this stylish front pouch. 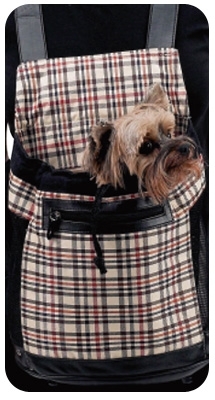 A must have for those who travel everywhere with their pooch. Features a mesh window on each side, adjustable front toggle, cozy plush beige interior, removable and washable carpet. Adjustable black nylon straps with quick release snaps fit comfortably and securely around shoulders and across back. Holds up to 10 lbs. Spot clean. Measurements: 11" x 6" x 11"